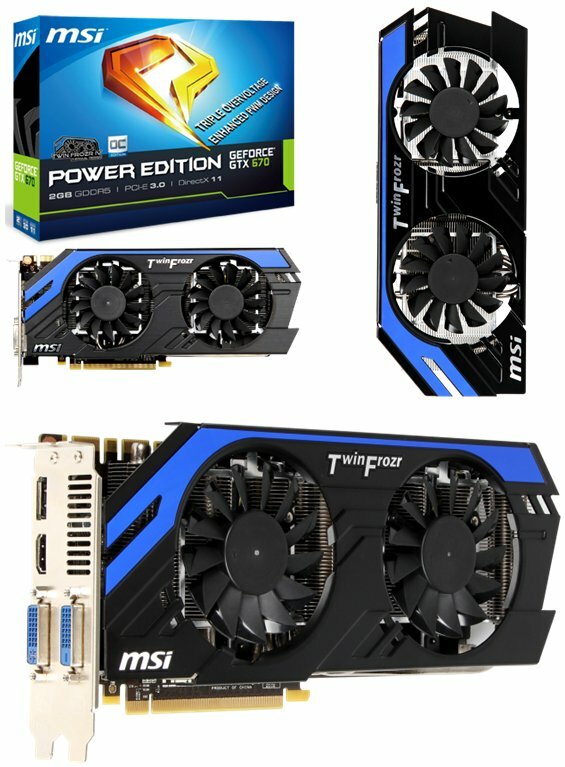 MSI introduces the GeForce GTX 670 Power Edition. This model sports the Twin Frozr IV cooling solution, it has a 915MHz core (1019MHz OC), 980MHz Boost (1079MHz OC) and 2GB GDDR5 clocked at 6008MHz. The MSI GTX 670 Power Edition is equipped with MSI’s latest Twin Frozr IV Thermal Design. MSI’s exclusive Dust Removal technology automatically reverses the fan at startup to prevent dust build-up dust and optimize the cooling module’s ability to dissipate heat. Patented Propeller Blade technology provides 20% more air flow over a conventional fan and increases the effective cooling area. When combined with dual 8 cm temperature-controlled fan setup, SuperPipe technology, and a nickel-plated copper base, temperatures are effectively reduced by up to 20°C and noise by 11.7dB! MSI Military Class III components have been independently tested to meet many of the strict requirements specified by the MILSTD810G standard in order to guarantee high quality and stability. Military Class III components used on the MSI GTX 670 Power Edition include Tantalum Core Hi-c CAP, 30% more powerful SFC, and Solid CAP with up to 10 years of service life. This choice of materials reflects MSI's firm commitment to delivering trustworthy and dependable products to its customers.